I am currently constructing a model train layout and ... want to contruct a model of a train ferry. I will not be modeling the Solano itself but a fictional ferry that fits my layout and is similar in design to the Solano. ... are you interested in the "early" boat (1879-1905), the "intermediate" boat (1905-1915), or the late boat (1915-1930)? They look similar at first glance but the later boats have been beefed-up to take on the larger train equipment of the 1900's. Thoroughfare (left) and Herald (right). Just "discovered" the "Solano" and her history. I've long been aware that ferries once crossed the Carquinez Straits at Benicia– my dad lives in Benicia and has a nice view of the area. Next, I see on the web page that you hail from Michigan? I'm a transplanted Californian in the Detroit area. And as you might see from my signature below, I write for "Ships in Scale" magazine. Makes me curious- where is the Solano model now? And have you ever considered writing up an article? 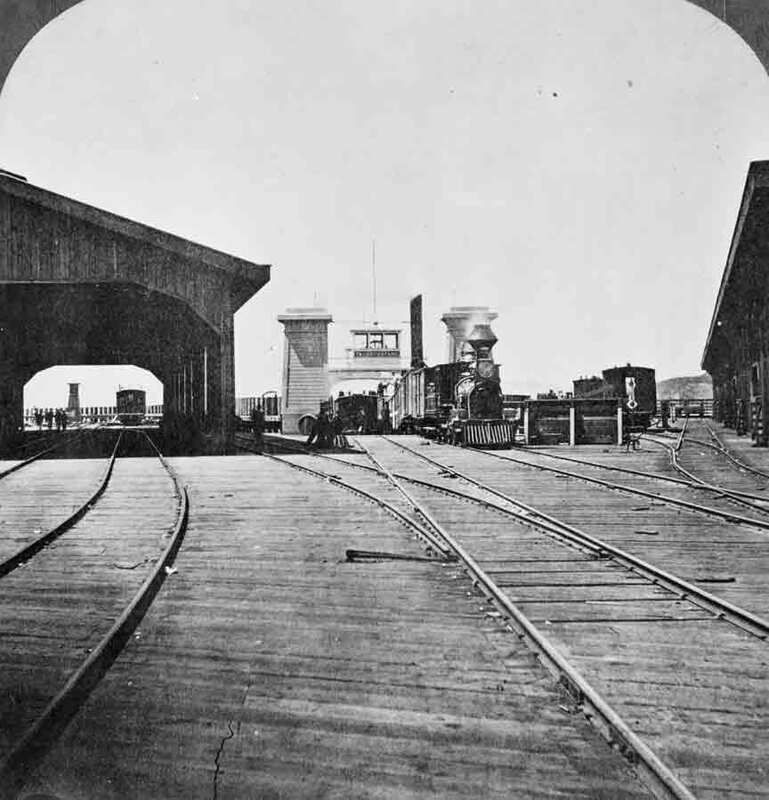 The Central Pacific train ferry Solano was placed in service in 1879, coenciding with a new passenger depot in Sacramento (larger and alligned with the bridge across the Sacramento River) and a reallignment of train service. Initially in 1869 the Central Pacific connected with river boats from Sacramento to San Francisco. 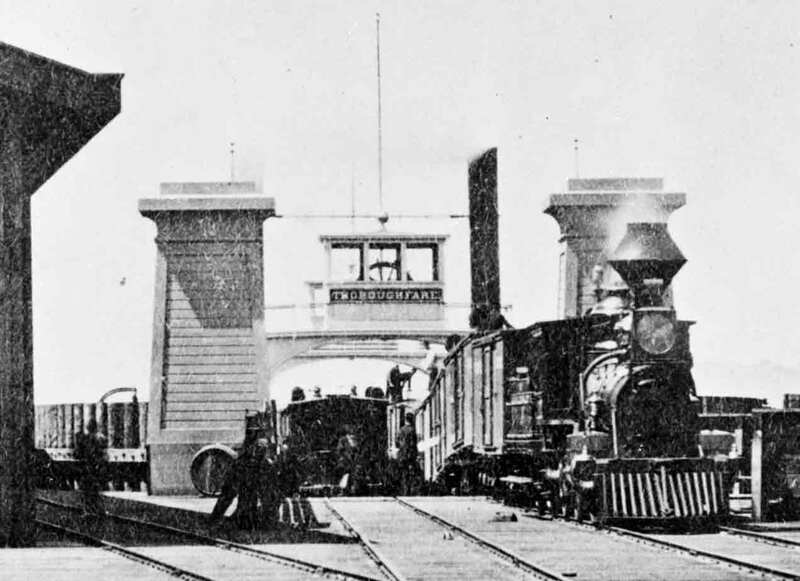 Through service to Oakland began in November 1869 via Stockton, Altamont Pass, Niles Canyon (site of current excursion trains) and Alameda/Oakland, with ferries to San Francisco. After acquiring the California Pacific in 1871, some Central Pacific express trains started from Vallejo (and boat connections to San Francisco), running through Sacramento. The Silver Palace sleeping car service to Carson City (with coach connections through to Virginia City) started in 1875 used this route. It was considerably faster than via Stockton, although many trains continued to use that route. The train ferries Solano and Contra Costa continued to provide service until the opening of the bridge (in 1930, as I recall). The remains of the Solano, stripped and rotting, lie in the nearby mudflats still today. 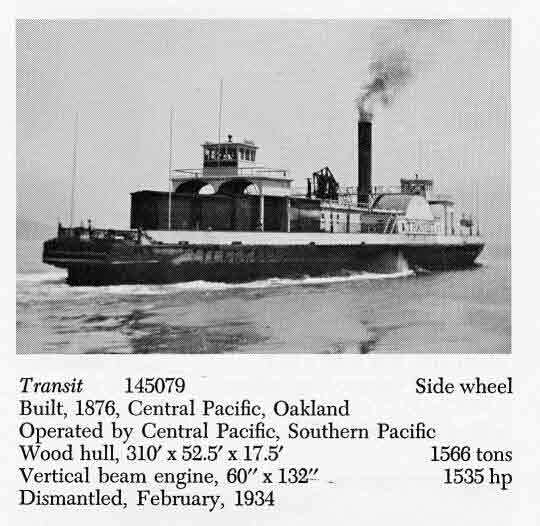 Railroad History 161 starting page 67 has this [Central Pacific train ferry Solano] history in a story about the Martinez-Benicia Bridge. ... I have a question for Mr. Wyatt, regarding the "stripped and rotting" remains of the Solano: would would you be referring to the boiler and other parts sitting in the shallows near the fishing pier at Eckley (near Crockett)? "The railroad ferry 'Solano' still lives: Historic artifact lies scuttled in Antioch"
also "Ferry changed bay transportation"
and the following for photos today. Aerial view of the wreck of the "Solano" at Antioch, California. "... I have a question for Mr. Wyatt, regarding the "stripped and rotting" remains of the Solano: would would you be referring to the boiler and other parts sitting in the shallows near the fishing pier at Eckley (near Crockett)?" Nope, the ferry remains at Eckley is the "Garden City". The Solano remains are off-shore near Fulton Shipyard Road in Antioch, CA. It looks like a bush covered island from shore. Construction details can be seen from the "water side" though, if you have a boat! We did a segment with Huell Howser (California's Gold Series) on the Solano. Part of the taping shows the wreck from the water side. You can go to Huell's website and order the segment if you care to. Note though that Huell (as excited as he was abiut the Solano wreck) wanted to paint a simpler "everyman's story." So this taping does not get into lots of detail, so may not satisfy many ferry foamers! Just a late comment on Steve's side note regarding the evocative decaying remains of a ferryboat at Eckley, CA. Those are the bones of the Str. Garden City, one of four boats inherited by SP when it acquired the South Pacific Coast RR in 1887. As one of the smaller vessels in the large SP fleet, seating only 790 passengers, she spent much of her life on the less demanding Creek Route (SF-Oakland Broadway), and on the Vallejo Junction-South Vallejo-Vallejo Wharf shuttle route in its last years. The latter route, established after direct San Francisco-Vallejo ferries were discontinued by SP, provided service to and from Downtown Vallejo for Overland Route trains, and also made connections to and from the little network of trains SP operated from South Vallejo that ran through Napa Junction to Santa Rosa, to Calistoga, and via Jameson Canyon (the original CalP line)and Cordelia to a second Overland Route connection at Suisun-Fairfield. It was kind of a predecessor of today's Martinez bus connections that reach some of these same places. When the Carquinez Bridge, the one now being dismantled, opened in 1927, buses replaced this link, and several of these older smaller boats were retired. I believe that the Garden City was sold at that time, and beached at Eckley for use as a fishing barge. She was intact and recognizable, though deteriorating, until just a few years ago, when she was destroyed by a fire. Garden City's big sister, the Newark, also from the SPC, was rebuilt in the SP shipyards into the mighty Str. Sacramento in 1923, and ran well into the 1950s, almost to the end of SP ferry service. She had a wonderful glassed-in fiddley through which little kids, such as your correspondent, could watch, hypnotized, the workings of the walking beam engine; this was a life-forming experience. After the Sacramento was retired, she was sold to Gordon McRae, who anchored her somewhere off Redondo, also as a fishing barge. I believe she went down in a storm about 1970. I am a model railroader and a model ship builder. I came across your model of the STR Solano and upon further research found the article on the HO Scale model of the STR Solano. Are there any Blue prints of the scale model available? I thought that I might attempt to build a scale model in 1/64 th scale. We found the early circa 1879 Solano ferry plans at an engineering library in Kansas City. They came to us as reduced 11x17 re-copied copy machined images, so the line work was rather poor. But the plans have a lot of details incorporated into them in the clearer areas. If you decide to do the early 1879 ferry, you are probably in pretty good shape layout wise. But our model was the 1930's version. What we found is that the early plans and later photos of the ferry would not always jive with each other. It was obvious, for instance, that hogging posts and stacks got thicker and taller, but they also seemed to move. That was very mysterious till we realized that the Solano went through some major changes between her early and late years -- changes not very apparent unless one studied her plans and photos very carefully. In one instance, nearly 500 feet of cabin wall was moved about 3-4 feet, and the only clues were something we spied and later called 'bridge shelves". In another instance, when comparing photos, her stack positions just did not seem right. As it turned out, Solano's boilers had been reconfigured, which moved her stacks over maybe 10 feet. On a vessel the size of the Solano, 10 feet is miniscule, but it's just enough to make you say "What the heck...". 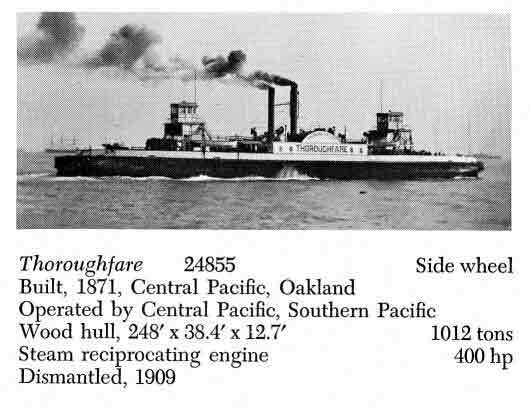 Lacking hull plans, we relied on Solano's sister ferry, the Contra Costa, for details (found within some marine engineering articles). Jim Turner, our ship expert, is into detailing his creations as close to the original as he can get them. The Contra Costa hull plans showed him some juicey details such as where the hull was reinforced and that the hull was a double wall affair with salt inserted between the walls.